Please Mind the Platform Gap: Is Project Work Really That Hard? Please Mind the Platform Gap is a fortnightly column aimed at preparing Year 4 RI and RGS students for the challenges of JC life. Written by Year 5s from Raffles Press who have “been there, done that”, each piece covers a different aspect of life “on the other side”. Project Work must be the only topic that the Twitter users I follow never seem to tire of tweeting about. Because PW work submission deadlines are the same for all, you can be sure to find people commiserating about how difficult thinking of a suitable PI (Preliminary Idea) is, or the terrible length of their GPP (Group Project Proposal) days before it is due. Year 4s who have yet to enter RI, when encountering such grievances raised by their seniors, must imagine PW to be a strange and formidable subject. The compulsory subject was created by the Ministry of Education specifically to challenge A Level students with the “opportunity to synthesise knowledge from various areas of learning”, such as newspapers, personal interviews and surveys. Implemented in 2003, PW, unlike regular subjects, will require analysis of information that is not be served up in textbooks, but collected through independent research. Fortunately, RP students will have gone through Research Studies (RGS) or Research Education (RI) in Year 1-4, and hopefully have acquired some ability to find and apply appropriate information. PW also implores students to “generate ideas”, in addition to analysing and evaluating them. While regular subjects already involve the skills of analysis and evaluation, students are less likely to be familiar with coming up with good and suitable ideas, and this is where they might stumble. Some may say it is fortunate that Project Work only lasts a year. It occupies two blocks each week, and you emerge with your H1 A Level grade at the end of Year 5. Your grade is needed to apply to local universities, but may not count for ones overseas. In RI, more than 4 in 5 students receive an A, according to informal sources, but the journey is not easy. The Project Work cycle starts with the release of the year’s two questions. For 2012, it is “Waste Not, Want Not” and “The Eureka Moment”. The first option tasks students to identify an area of wastage, highlight the problem and propose measures to reduce it. The latter requires adapting an existing invention or discovery to meet a need in the community. A class will then be divided into groups of 4 to 6, allocated by the PW and Civics tutors according to personal discretion. Some tutors are said to distribute ability evenly across groups, while others try to promote class bonding by putting acquaintances together. 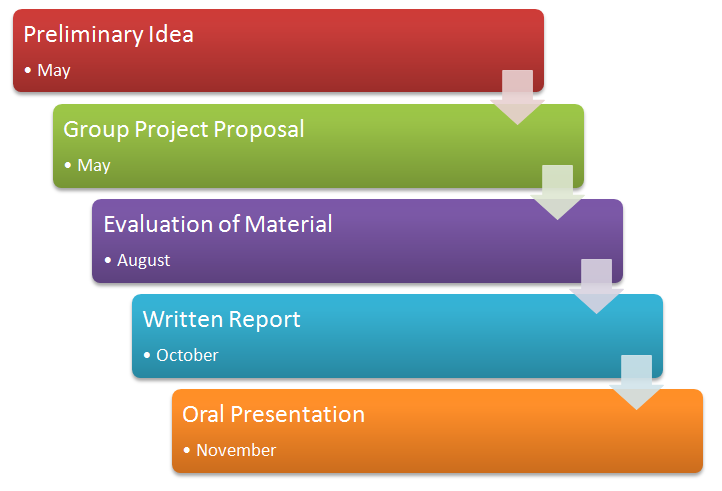 The first task of the year is the Preliminary Idea, an individual assignment that requires proposing a topic for one of the questions and evaluating its suitability as a project. For example, one could tackle the wastage of paper in schools, and debate its feasibility as a PW topic. Then, groups will convene to produce a Group Project Proposal that suggests a topic they will undertake for their project. After this is completed, groups can begin on their main task, the Written Report. The Written Report firstly requires groups to conduct research. For example, this year’s Wastage question will need analysis on the current causes for wastage and measures that do not sufficiently alleviate the situation. Then, groups will need to generate ideas to propose an action plan that meets the task demands, and evaluate their suggested strategies. An additional individual task, the Evaluation of Material, tests students on their (surprise!) research evaluation skills. Finally, groups will conduct an Oral Presentation of their findings and plans and compile their work in a Group Project File. Project Work is really just a subject that demands students to demonstrate certain skills. One must bear in mind that it was created because policy-makers wanted local students to be able to generate ideas to solve problems by applying knowledge, in addition to being strong in content knowledge. Additionally, it seeks to emphasise oral communication skills and collaborative work. Fortunately, RP students entering RI (Yr 5-6) will have encountered assignments that needed verbal presentations and group work. Still, familiarity with such skills does not guarantee you a smooth Project Work journey. Ideas take time to come about, and group work requires coming to a consensus on the direction of one’s project and good communication. Sometimes, it may be easy to get lost in the midst of yet another redrafting of your WR, and focus on expounding on your project rather than demonstrating the skills needed. Some students also face repeated rejection of their topics and drafts, and develop a self-defeating wariness towards Project Work. Thus, try to give yourself and your group adequate time to develop your ideas. For your topic, think of possible limitations and search for reliable and relevant sources beforehand. Careful evaluation of your topic at the start will reduce the number of times your WR requires rewriting. Project Work can be an enjoyable experience if you dedicate enough time to demonstrate the necessary skills in completing each task, and develop a good working relationship with your group mates. The latter is a separate issue, so look out for a subsequent article on PW group mates closer to the end of the year! ← Read our previous guide to dating models here. It is going to the end of the year and I have yet to see a subsequent issue of this topic.